Merry Christmas Everyone, My name is Woofy, I am 2 years old and I have a Christmas wish to share with you. Recently I was surrendered by my breeder along with multiple puppy siblings and my Mommy. Because we are Havanese all of my family was adopted into their new forever homes but I was left behind. I was born with bowed legs and I have always walked a little funny (the humans tell me it is called hip dysplasia). My breeder had me neutered because I was not good enough to breed. While I am glad they did not put me to work I wish they hadn't stopped caring about me once I stopped being useful. I didn't get the baths and haircuts that I needed and my ears never got cleaned. We Havanese have long hair in and around our ears and if our humans don't take care of it we are at risk to develop tumors in our ears. My tumors have gotten so bad that my ears have closed off and I am left unable to hear anything around me. My ears itch all of the time and I try to shake it out but nothing works. My new foster parents say that if I can get surgery my ears will stop bothering me and I might even be able to hear again. Once my tumors are gone as long as my forever humans continue to take care of me the tumors won't come back. My Christmas wish is that my foster family can raise enough money to help me get this life-changing procedure that will not only help me hear again but help secure a forever family. ** Hello, my Name is Alicia and I am one of Woofy's foster parents. We stopped by our local pet supply store for kitty litter and while we were there we went over to say hi to the rescue puppies and kitties and noticed this sweet little boy. His crate said he was 2 and needed special attention to his ears and diet. He looked sad and I couldn't help but notice that the crate next to his was also a Havanese 9-month old that had just been adopted. I asked to speak with Deb, the recuse's founder and she explained to me he required surgery because his breeder didn't take care of him properly. She showed us his ears and instantly my heart broke. I held him for some time and then placed him back in his crate. When I did that he started to whimper and as I stood in front of him he began to howl. His cry brought me to tears and I knew we had to do something. 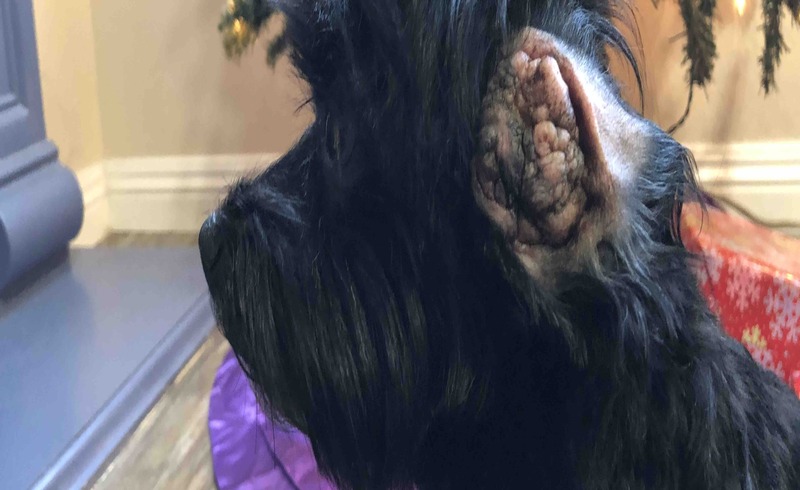 Deb told us they had taken Woofy to the Vet and that he was healthy minus these massive tumors in his ears and that the surgery would be 4500.00 to treat and remove the excessive growth. She also had told us that he would have to be put down because he most likely wouldn't be adopted with this sort of condition. Deb said she couldn't put down a perfectly healthy dog because he needed a surgery and she was determined to find a way to give Woofy the life he never was allowed. I agreed with her and we decided to take him home for the holidays and work hard to raise the funds and grant him his holiday wish. The money raised will go towards his surgery and any post-removal treatments he may need. Any leftover money will be given to Debs Claws and Paw animal rescue which is a registered 501 C 3 in Yuba City California. Deb and her recuse adopt 2-6 kitties to perfectly matched families daily and when she has puppies or adult dogs, the adoption rate is 100%. In the 40 years Deb has been running a rescue she has only had to put one dog down due to a fall that resulting in multiple broken bones. She is a community staple and a hero to countless lost or abandoned animals. Please help us give Woofy a new life and help find him a forever home where he can be loved and cared for. Hello friends of Woofy! Tomorrow he goes in for his final surgery on his right ear! His left ear has healed up pretty well however, he has to have s little skin bubble removed tomorrow but other than that his right ear has healed! 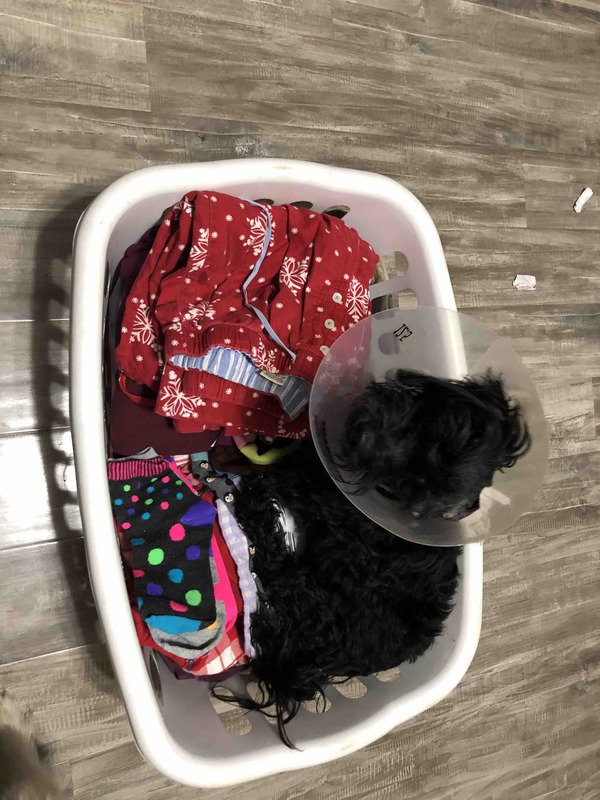 Tomorrow will be the same type of surgery and he will be in a cone of shame for a few weeks while the stitches heal. In the past two months of healing, Woofy has become a happy and funky fun little dog! He plays with the big kids and often tries to be the big guy of the yard while standing y’all on a water tank over looking the yard. He is fully potty trained, house broker, and crate trained. He has come such a long way and continue to amazing everyone who crosses his path. We are hoping this sweet boy will be ready for his forever home and adoption by May. We are still short in funds and anything helps. Please share the link and spread his story of helplessness and recovery to all of your fur baby loving friends!!! Again, we would like to thank everyone for their kindness and generosity these past three and a half months and helping us get this sweet boy back to being a puppy and getting healthy!! Woofy is 5 days post op on his left ear. He hasn’t been scratch at it however, his right ear is causing him so many issues and he keeps trying to scratch it. We should be going back to the vet tomorrow or soon to check his stitches and find out if he has popped any of them. Thanks for sharing his story and helping us continue giving him the care he needs. IM BAWLING AND AM SO THANKFUL TO SO MANY PEOPLE. I JUST RECEIVED THE EMAIL FROM IAN SOMERHALDER FOUNDATION STATING THAT WOOFY WAS GRANTED 1,300.00 FOR HIS TUMOR REMOVAL IN HIS EARS. THIS MEANS WE HAVE SUCCESSFULLY RAISED 2465.00 FOR HIS PROCEDURES!!!! IAN SOMERHALDER IS ONE OF MY FAVORITE GUILTY PLEASURE ACTORS WHO HAS A HEART OF GOLD FOR FUR BABIES AND YOUTH. IF YOU DONT KNOW ABOUT HIS FOUNDATION PLEASE LOOK IT UP OR SEND HIN A TWEET THANKING HIM FOR HIS GENEROSITY. Tomorrow is the day! Woofy is having the first of two procedures done in the morning. We still have no word on the grant but we are still keeping our fingers crossed. Thanks for all the shares and the donations. It’s going to help a lot tomorrow. 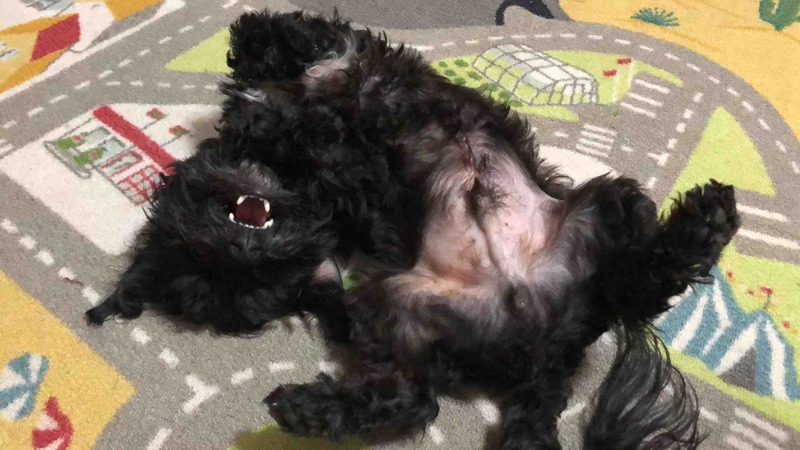 Check out Woofy’s fang photo!!! !